… gets another post cause andrea and sarah are with me now. though we have been mostly been splitting up during the day. i am doing prep stuff for sean`s visit, for going to the jungle afterward, and finally for my flight home. today i packed my bike and put it in storage. it was fun to work on my bike. i rode it here a little but i have mostly been warned that it is dangerous. i have a sneaking suspicion that Peruanos are waaaaay cautious. from everything i have heard. very over protective. i am trying to get last minute vaccinations for the jungle. i am basically all set though. so the big reason for this post is that Val took me out to the most amazing meal. 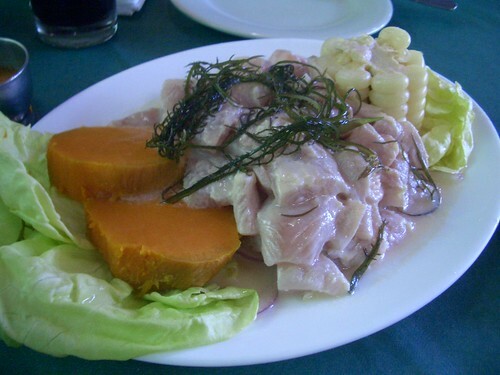 peru is VERY proud of their cuisine. i have been hearing about it for a long time, and not just from Val. i am glad i let her sit me down with a good meal. for lunch we went to the old local favorite El Mardisco in the Lince neighborhood. there was a plate of “popped” giant corn too. i guess the shell of the corn is so tough it doesn`t explode. but is kinda fluffy inside. dry. so. mmmm. i am starving now. this was a really rich meal, lemony. i didn`t think i’d be able to eat it again for a couple days at least. not to mention, this place made it perfectly. i was surprised just HOW RAW the fish was… so i would not want to eat it just anywhere. i learned that lesson when i tried to get a moqueca at the corner counter in salvador. being brazilian or peruvian does not MAKE you a good chef. so, i am hoping Val will take me there again when i stop in Lima before my flight to the states. hum. what else? we went to a parade with some fun dancing and costumes. there was this little fair nearby of people selling everything imaginable and a couple stages with kids doing dance routines. weird. we tried good food and drinks. last night we braved the the Pizza Ave. where each restaurant sends hawkers running out with menus and promises of free drinks. it is so unpleasant. imagine a squad of cheerleaders running at you all talking and trying to coral you. you need to exercise your zen. block out everything. we discussed our strategy before heading in. this was good. we walked the length then took the best beer and garlic bread offer. the pizza was good. then we had a crazy ice cream and headed out to Barranco, the bohemian neighborhood. the bars were empty so we played pool. Val has dance party plans for us on wednesday night. another night i went out with Val and met this military contractor from Iraq. i hadn`t heard about this underhanded military stuff yet. he was a tremendous bore, but now i am tempted to go back and ask him more questions. frightening. e- isn’t ceviche soooo yummy!